According to the 1840 Census, the state that led the nation in total wine production was North Carolina. 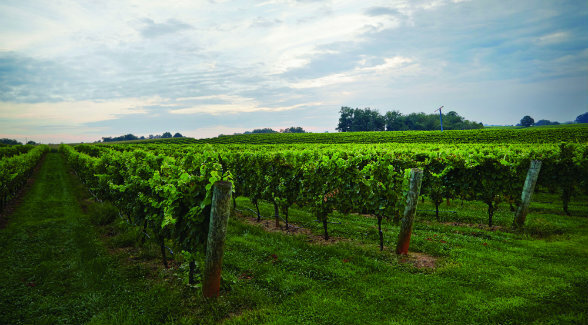 From vineyard to glass, Shelton wines are crafted to exhibit classic characteristics. The fate of Raleigh’s ill-fated “Lost Colony” has remained a mystery for more than four centuries. Not so with the demise of the state’s early winemakers. Prohibition put an end to their craft. By the time the 18th Amendment was repealed, tobacco was North Carolina’s cash crop. Beginning in the 1950s, Interstate 40 was christened Tobacco Road. Charlie and Ed Shelton remember those days. The two brothers grew up in Mt. Airy, a picturesque community just south of the Virginia line that is best known as the hometown of actor Andy Griffith. Launching Shelco in 1978 dovetailed precisely with North Carolina’s rise as a leading financial center and corporate hub, especially in Charlotte. Throughout the 1980s and the 1990s, Charlie and Ed played a key role in reconfiguring the skyline of the state’s largest city. The Sheltons’ attention to detail is evident in all elements of their winery, including the exquisite entrance. By the late 1990s, the brothers decided they wanted to spend more time back home in the Yadkin Valley. Not that they had any intention of slowing down. Anyone who has ever met Charlie and Ed instantly recognizes that retirement is not an option for this tandem. Taking on new challenges is hardcoded into their genetic makeup. So they decided to combine their passion for wine with their desire to revitalize a once proud region. Creating a destination winery fit the bill. “We did a good bit of traveling together, and we always wound up in the wine country. We gained a great appreciation for what people were doing with wine. They made wine because they loved it,” says Charlie. Fortunately, the Yadkin Valley features superlative soils. “You had a lot of minerals coming out of the Blue Ridge Mountains mixing in with the red clay. 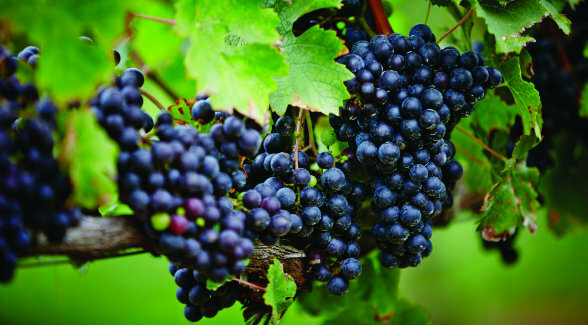 It makes for good drainage for our types of grapes, vinifera grapes, European-style grapes. Go east and you can grow the scuppernongs and muscadines pretty easily,” Ed says. 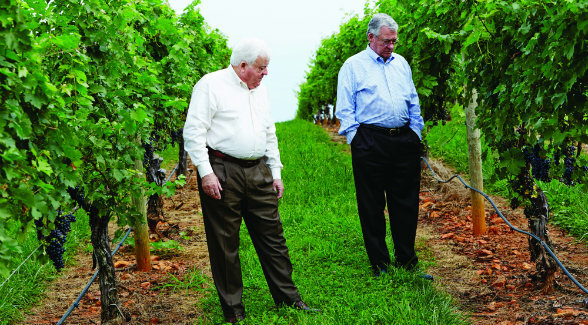 Soon afterward, the Sheltons took the lead in getting the seven-county region American Viticultural Area (AVA) status. “It was about a two-and-a-half-year process,” Charlie says. 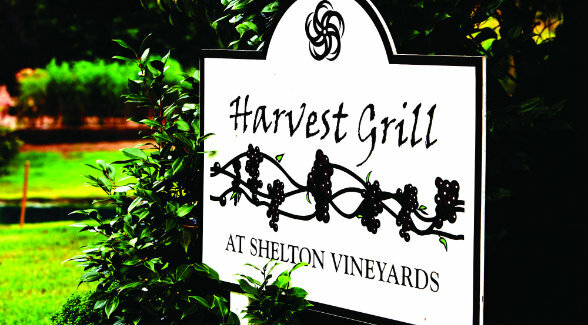 The best way to enjoy Shelton Vineyard wines is at the winery’s Harvest Grill. And their wines? 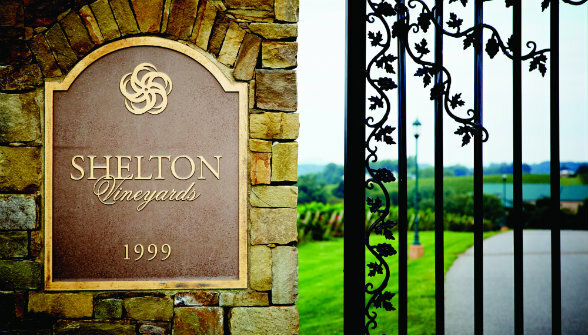 Shelton Vineyards has won over 250 awards. Although they do a brisk mail-order trade, the best way to enjoy them is at the winery’s Harvest Grill. 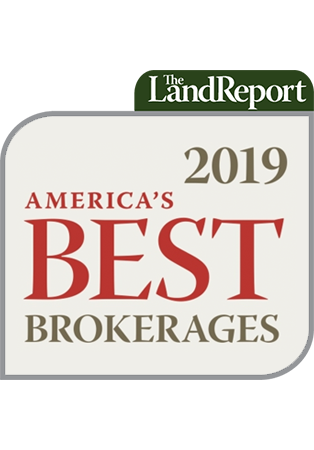 The Crispy Cornbread Crab Cakes pair perfectly with the Estate Chardonnay, and the Grilled Pork Medallions with Capicola and Provolone bring out the best in the Tannat, a lighter red varietal popular in South America. Of equal importance to both is the positive impact their latest venture has had on the local community. “I think right now we’ve created well over 100 full-time jobs since we opened the vineyards,” says Charlie.